WHAT: These incredibly fun little guys make up a set of mini figures called the "Greasebat & Friends Gummi Play Set," with Greasebat being the main man (well, main monster), joined by Stee-Gar, Spikewad and M5 Bravo. These creatures are the creations of Jeff Lamm, an artist who describes his work as being "heavily influenced by Japanese monster toys, Ed 'Big Daddy' Roth, pop art and vintage manga." Personally--not being familiar with any existing back stories to the characters--they also look a bit to me like what might happen if Where the Wild Things Are were set in outer space! Or Japan. Any way you want to think about them, Greasebat and company are really cool little weirdos. 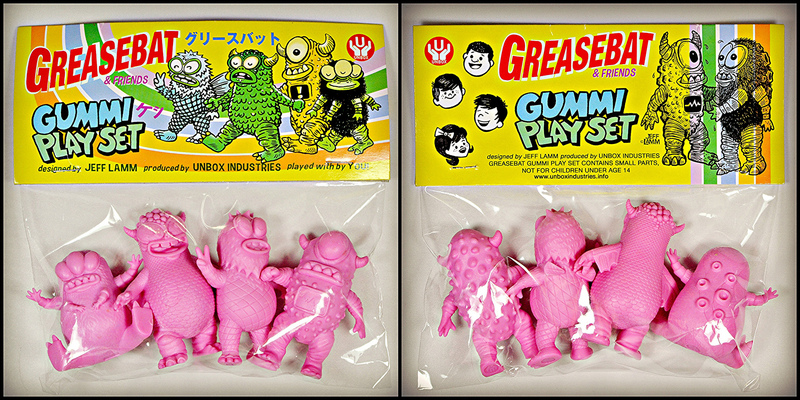 While Greasebat monsters have previously been brought into toy existence in the form of larger designer figures, the Gummi Play Set is something new, finding the characters interpreted in smaller keshi form. They've been produced by Unbox Industries and each stand about 2 to 2.5 inches tall, but actually feel quite a bit larger than most keshi because of their thick, bulky sculpts as well as their material. The material has a very unique feel to it that's not typically found in these types of toys (or pretty much any types of toys, for that matter). What you feel when you pick one up is sort of a soft, rubbery texture, but upon closer inspection you find that the figures are actually quite firm and solid. It kind of plays tricks on my fingers, and I like that! Between the bulk of the sculpts and the material, you really feel like you're holding a quality toy. It's apparent Unbox put a lot of care into producing the set. The four figures come bagged together along with a header card illustrated with eye-catching, retro-style artwork that features all four characters. The sets are offered in two different colors: pink and orange. When I ordered a pink set, I wasn't sure if it would look like a true pink or more of a M.U.S.C.L.E.-like flesh-pink. I was happy to find out it's more of an actual, bubblegum pink. It's really quite vibrant, especially when seen in person. Greasebat: The leader of the pack. I can't decide if he's happy or ticked off. Even if he's ticked off, he can't avoid looking kinda cute, with his tubby body, huge eyes and tiny wings. Perhaps my favorite thing about this figure is the detail and texture of the scales all over his body. I also love the little bumps all over the top of his head. I'm not familiar enough with the character to know if that's supposed to be something specific, but whatever it is, it's a fun touch. M5 Bravo: This guy might be my favorite. He's got that retro robot thing going on which never stops being cool. But he also definitely looks like a monster at the same time. So I guess you could say he's a robot-monster hybrid. And really, how can you top a robot-monster hybrid? I also enjoy his bumpy, oval-shaped body and the fact that he's a cyclops. Spikewad: The figure that stands out the most among the four, because of the fact that he's sitting and the rest are standing. Spikewad has a ton of personality, thanks not only to the sitting pose but also to his three eyes and four little arms. He kind of looks like he just tripped and plopped down, and with his huge body and mini arms, you have to wonder how he's going to get back up! Stee-Gar: If you look at photos of the original, larger Stee-Gar toys, the character has an abominable snowman sort of vibe. In keshi form, he looks a bit more birdlike to me. In any case, I dig the criss-cross pattern all over his body, his big mouth and his, "hey guys, wait for me!" pose. Considering these sets go for just $15 a pop, you really can't go wrong with the Gummi Play Set. The figures have fun sculpts, are very well made, and come in two cool colors. And according to discussion in this thread over at Skullbrain.org, a second Jeff Lamm Gummi set may already be in the works, so with any luck these four guys will have some more friends to join their monster party at some point. WHEN: The Greasebat & Friends Gummi Play Set first became available in summer 2013. WHERE: The sets were offered initially at the Taipei Toy Festival and the San Diego Comic Con, after which they invaded the Unbox Industries online store. At the time of writing this, both the pink and orange sets are still available to purchase there. 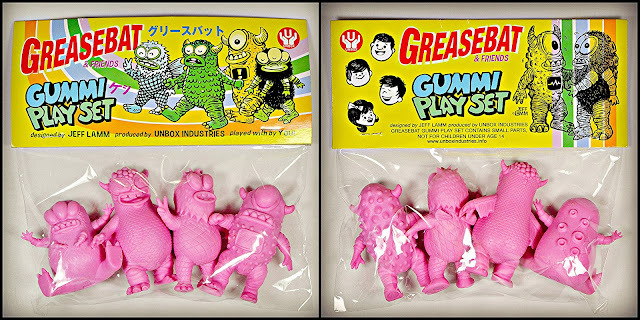 WHO: Greasebat & Friends characters and figures were created and designed by Jeff Lamm, while Unbox Industries handled the production of the Gummi set. Thanks man, wonderful review as always. If i did not already have these i would be picking them up for sure. Nice! They are well worth it.